I'm currently on a mission to find the perfect cleanser for my skin. If you've read cleanser reviews I've done before, you'll probably know that the cleansing step is actually one of my favorites - and can be one of the most difficult for me when it comes to finding a formula that I really love. I've completely cut foaming cleansers out of my routine - they strip my skin and leave it feeling tighter than it needs to be - and have really zeroed in on what I'm looking for. Basically, what I want is a cleanser that's going to perfectly strike the balance where my skin feels clean, but also nourished. Not too much to ask, right? 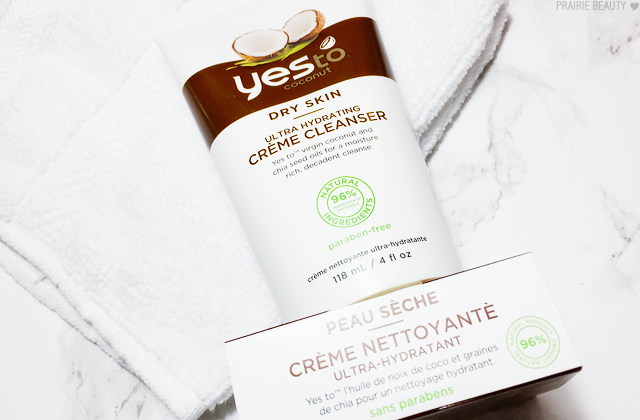 After doing a little bit of digging around the internet, I decided to try out the Yes To Coconut Ultra Hydrating Créme Cleanser and I'm all set to review it for you guys! 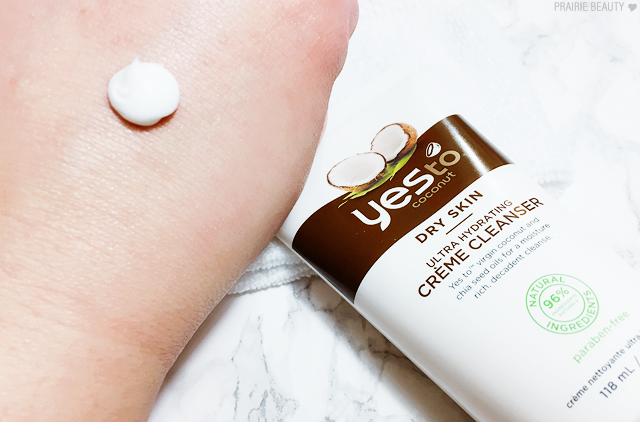 A rich, daily cleansing emulsion for very dry skin. 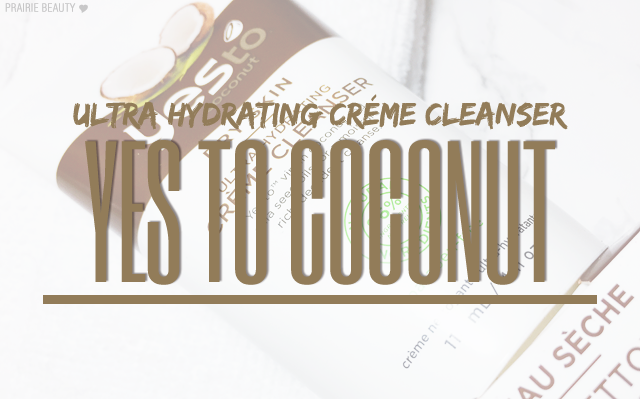 Bolstered with all the benefits of virgin coconut oil, the Coconut Hydrating Creme Cleanser delivers intense hydration to target troublesome dry patches. Enriched with 96% natural ingredients the creamy formula is able to remove stubborn makeup and dirt in the gentlest of ways to reveal conditioned and nourished skin. The texture of this cleanser is surprisingly light and creamy. I think I was expecting it to be a little bit thicker, but I actually like the texture that it is because it works really easily over the skin. I personally like to use this as a second cleanse in the evening or as a morning cleanser, because I don't think it'll be intense enough to really break up and remove makeup. When I remove this, I always use a face cloth because I find that just rinsing with water can leave behind a little bit more residue than I'd like. For me, that's actually how I use most cream cleansers because I find that they cling to the skin a little bit more. After using this cleanser, my skin really does feel both clean and hydrated and I really don't find that I have to rush to apply the rest of my skin care routine afterwards. 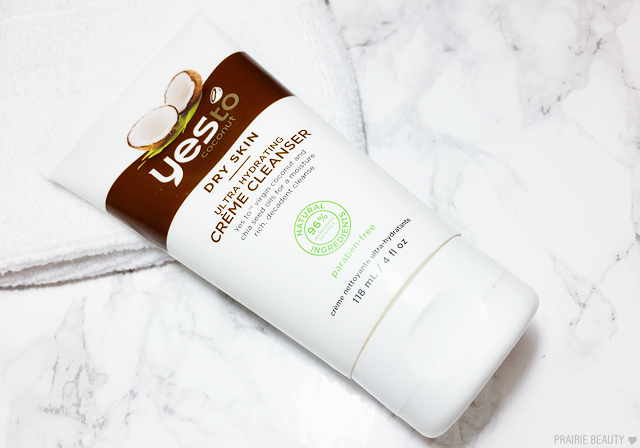 I definitely think this cleanser is better suited to dry skin and I suspect that my skin won't love it as much during the summer when I start to lean a bit more combination. That said, I do think this is a fantastic cleanser for my skin type in the drier months and I've really enjoyed using it. For around $10, I really think you can't go wrong with this cleanser if you've been in the market for something that isn't going to dry your skin out. I don't know that I would recommend this for oily, combination or acneic skin, but if you're in the normal to dry or very dry skin type I think this is definitely worth trying out!